Recognised by the prestigious #HRWINS list as a HR Company to watch out for. The business case for Employee Engagement has been made but many organisations are struggling to create high levels of engagement. 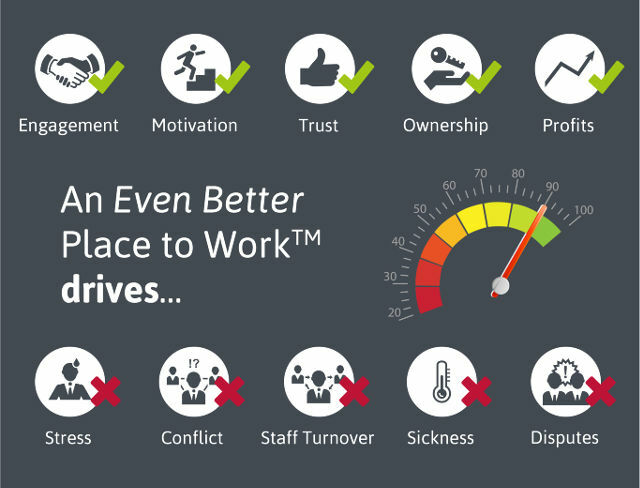 An Even Better Place to Work™ (BP2W) is a practical, friendly solution that quickly creates well-led, highly engaged and productive people. It has been developed by psychologist and author, Shay McConnon, over a ten year period. An Even Better Place to Work™ is an on-line, self-managed solution of measures, resources and activities that enables people to quickly improve the quality of their work lives. People have their own confidential web space to access resources, record their action goals and track progress across seven key indicators. The rich data collected through the seven indicators (which is always current) allows managers to gauge the ‘health’ and performance levels of the company and to make interventions which are targeted to real needs. Reduce this cost dramatically. Request a free BP2W demo HERE.